Very cool, many thanks for that. I really appreciate it. I added everything (plus some free bookcase that i found online) into my basic interior decoration class. Looks even better than i expected... I think that the window frame should be a bit thinner, i.e. it shouldn't reach that far into the room. This isn't that noticable in this scenes, but i can also place it on the left wall and that looks really more like a shelf than a window frame. Any ideas what else could be added without much affords? Maybe a chair or some table decoration (books, plates, mugs...)? That looks pretty good. I'll scale back the window thickness a little bit. I'll also see if I can come up with a simple chair and plate. You could probably just add the chest from the game here and there also. Maybe some things you can pick up like wine bottle, cheese and bread, potion, etc. If you are going to do that kind of thing. chair. 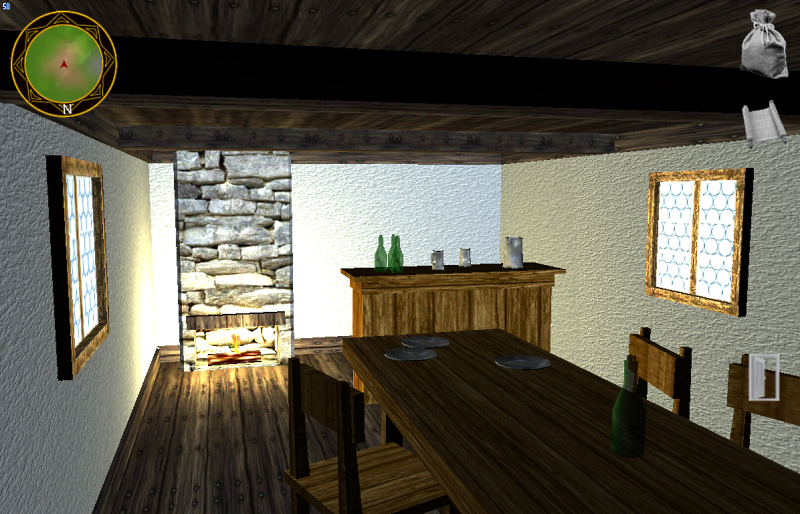 Same woodgrain texture so I didn't include it. What do you think about bread, wine, etc? Is it that kind of game? About the picking of cheese and stuff...i'm not going to add this to the game. The interior view isn't planned to be interactive. 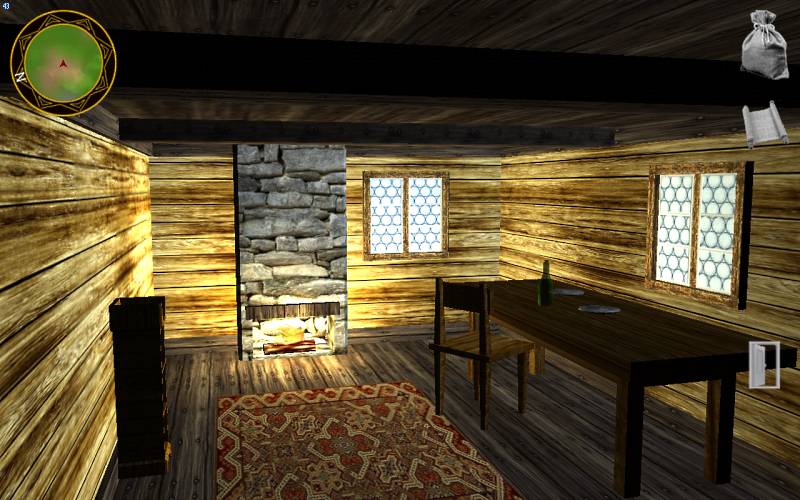 It will be animated (fire in the fireplace, npcs breathing and such) but you won't be able to move around. 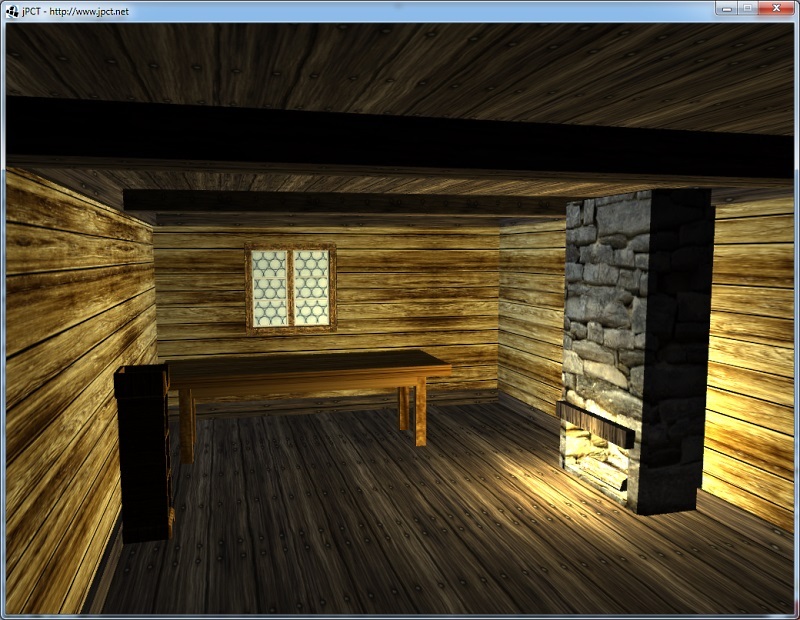 If i would allow for this, i would have to implement lots of additional stuff (like making the npc react to your actions in the room, different rooms for larger building etc.). I simply don't have the time or the resource to do this. 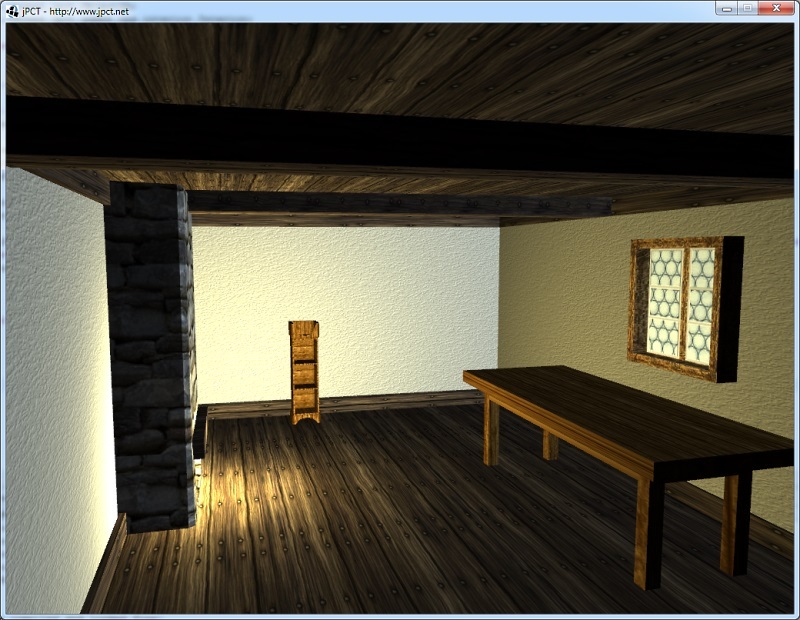 This static 3d view allows you to actually enter a building and talk to the owner but not more. 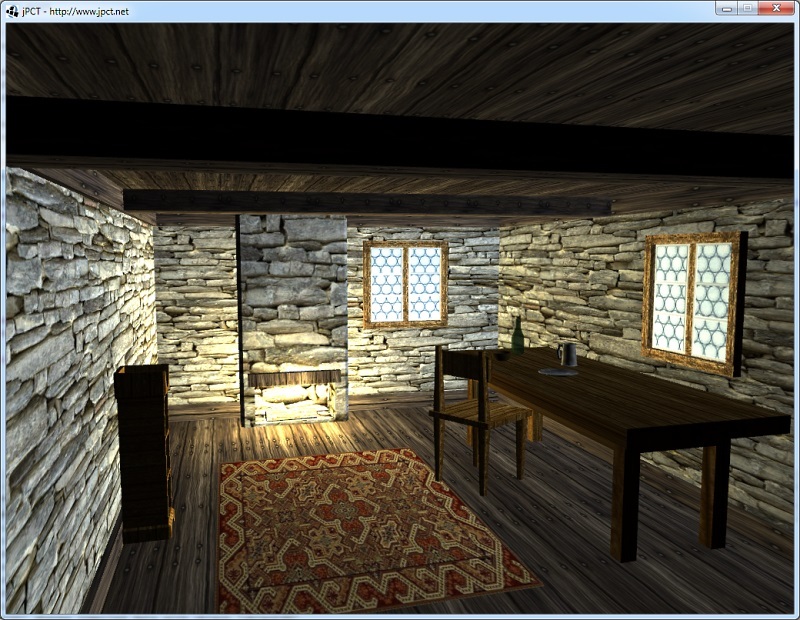 It's like these 2d painting of interiors that you got in classic rpgs. It also simplifies the way of building this interiors. 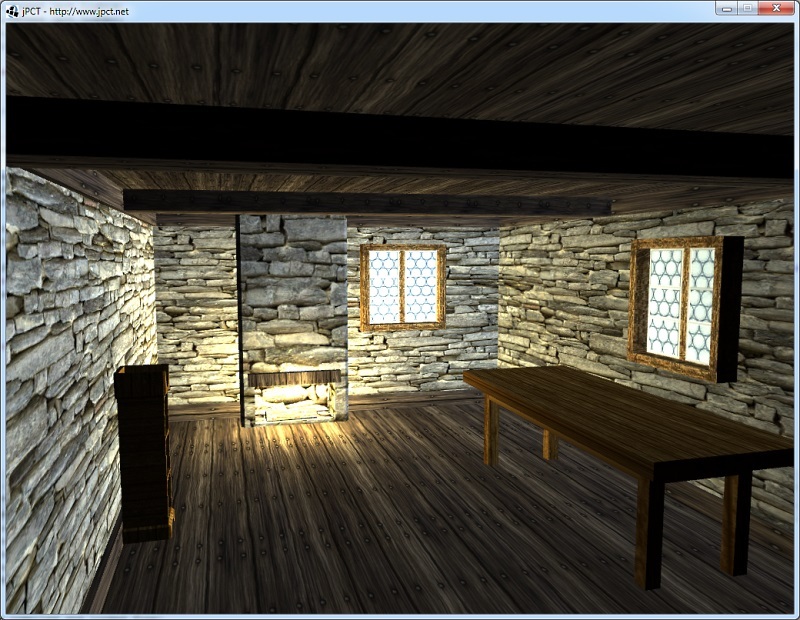 I don't have to model each hut, i just enable/disable stuff, move it around and change some wall textures based on some properties. The result won't be Skyrim, but it'll serve me well. And about the chest: I liked the idea at first, but i'm not going to do this. The chest actually serves as a container for loot in the wilderness. If you see it in a house but you can't access it, it's just not logical in the game's context. Looks good. It's probably better to limit the scope as you are planning because rpg's can just spiderweb out and never get finished. I like the rug, gives it a little more homey look. I've added it to the game...so you can now enter buildings. There's still a lot missing like more variety in the interior combinations and almost neglectable stuff like NPCs that live in the houses , but anyway. It feels great to be able to enter any house or hut you like and they all look a little different from each other (and may it be only the stuff on the table), the fire is burning and crackling and the music changes to some slow and gentle tune. Would that be sort of like the table with a solid base? Cool you got it working already. Something like this: http://www.monstermarketplace.com/living-room-collections-and-sectionals/brandon-warm-cherry-bar-counter, just wider. OK, I'll do a simplified version of that.